Big Fish Games, the world’s leading online destination for games and interactive entertainment, has announced the launch of Mystery Case Files: Return to Ravenhearst, the fifth title in Big Fish Games’ blockbuster hidden object-adventure series. The Mystery Case Files franchise is the number one brand in casual games and has sold more than 2.5 million units to date. Mystery Case Files: Return to Ravenhearst takes players back to Ravenhearst Manor, a mysterious 19th century mansion constructed by Charles Dalimar as a symbol of affection for his love, Emma Ravenhearst. In the first visit to the mansion, taking place within the hit game Mystery Case Files: Ravenhearst, players explored the haunted dwelling and pieced together the mystery of the mansion’s now-deceased namesake. In the latest installment of the series, Mystery Case Files: Return to Ravenhearst, the Queen of England has summoned the player back to the now-decrepit mansion to shed some light on the manor’s dark past and put the mysteries of Ravenhearst to rest, once and for all. 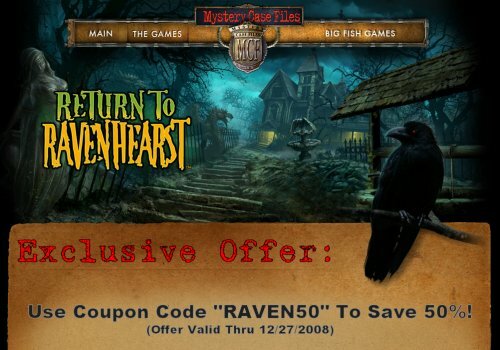 Mystery Case Files: Return to Ravenhearst is the fifth title in the critically-acclaimed Mystery Case Files series which includes Mystery Case Files: Huntsville, Mystery Case Files: Prime Suspects, Mystery Case Files: Ravenhearst and Mystery Case Files: Madame Fate. when will this be availibe to buy in a pc box as i have all the other mystery case files in pc boxes and really really want this in a box too!!!!! please any body let me know….. i love these games.